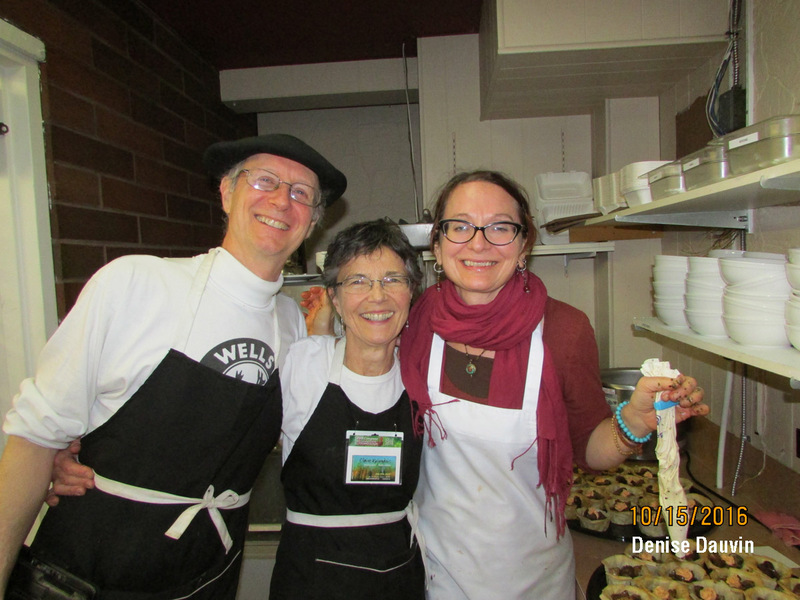 We are very grateful to April Ottesen at Sassafras Savouries in Prince George for hosting a lovely Tapas fundraising evening for us on Saturday, October 15, and to Silvia for her innovative tapas creations and participation. Bill cooked with April and Silvia; Claire served, with Bill pitching in as more food emerged from the kitchen. 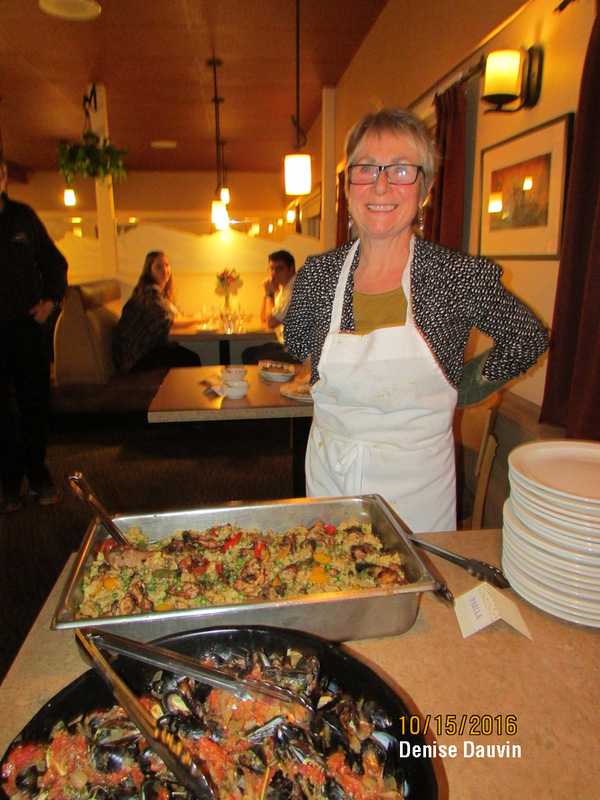 April with her sensational paella & mussels in wine sauce. We presented a brief slide show of our plant-based art exhibition at the Spanish Plant Pathology Congress in Palencia, gave out some door prizes, ate lots of delicious food, and received a generous cheque from Sassafras towards our travel costs. Best of all, it was a pleasure to work with April and Silvia and we had a lot of fun with them and all who attended. Thank-you so much! Bill, Claire & Silvia in action. Special thanks to Jovanka Djordevich for the donation of her grapes, to Roselynne Lambert for the donation of her honey, and to Denise Dauvin for hosting us in Prince George. Thanks also to Murry Krause, Brian Lewis and Jacqueline Holler for their support, to all who attended, and of course, all who have contributed to our Chuffed crowd sourcing campaign. 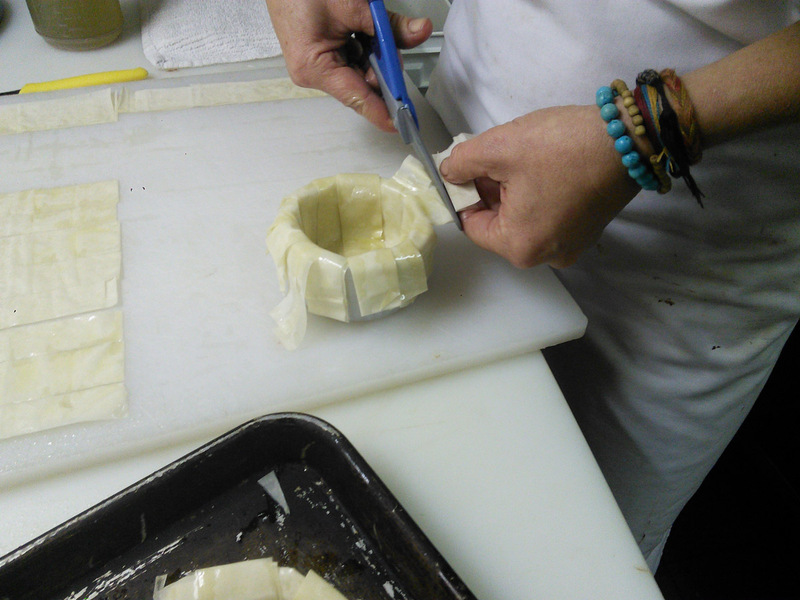 Silvia painstakingly making filo baskets for the mushrooms. Final menu: Patatas Bravas; Crustini with Chèvre, tangy wildberry jam & Walnut; Eggplant with Romesco & Rockfish; Grilled Green Onions with Romesco; Crustini with Romesco, Pimientos & Anchovies; Black Beans ~ Alubias ~ Babarrunak; Tomato Basil with Caramelized Onion; Champiñones a la Plancha in Filo baskets with Pimiento & spiced Chèvre; Paella and Mussels in Wine Sauce; Flan, including espresso variants! Plus lots of olives and crustini, with Spanish red wine available. Silvia adding spiced chèvre to her mushroom nests. Eggplant with Romesco & Rockfish.